Description: In this powerful, life-changing book, bestselling author Charles Capps outlines biblical truths that will help you become a powerhouse for God yourself rather than relying on the faith of others during difficult times. If you are like many Christians, when the going gets rough, you may have more faith in someone else prayers than in your own. We all know people who seem to consistently receive God's blessing, while we may seem to always be struggling just to stay afloat. Why does God seem to bless some people more than others? Has He given them greater faith? In the scripture it says, we all receive the same measure of faith when we become born again into the kingdom of God. The difference lies in what we do with the faith we have been given. 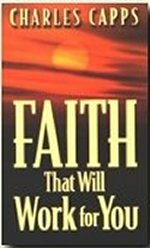 Formerly titled, How To Have Faith in Your Faith.